Like the Golden Palace Casino, the Golden Palace Poker site is licensed by CIGA, the Curacao Internet Gaming Association. Golden Palace Poker is an attractive online site that presents players with the opportunity to play poker for real money from the comfort of home or other convenient location of choice. Golden Palace Poker offers exciting poker games in different versions, attractive promotions, thrilling tournament action and customer support at all hours. The Golden Palace Poker site is powered by Playtech, the developers of its software. This is one of major names in the gaming software industry and has a reputation for a fair and reliable product. For the convenience of customers, this site offers assistance regarding the download of the software and also concerning the creation of an account by following steps that are displayed on the screen. In order to enhance the player’s online gaming experience, the Golden Palace Poker site presents a preview of games, rules for the various pursuits and game history, among other features. This site also offers a mini table view that is especially useful and convenient for playing at more than one online poker table at the same time. Golden Palace Poker offers its clients a variety of poker tables that range from high to low limits, according to the preferences of the player. At this site, players may enjoy Texas Hold’em, Omaha and 7 card stud entertainment. This poker site presents pot limit and no limit versions of the poker games. In addition, Golden Palace Poker boasts exciting online poker tournaments, leader boards andthrilling jackpot prizes. Many players look out for attractive bonuses when selecting an online gaming site. 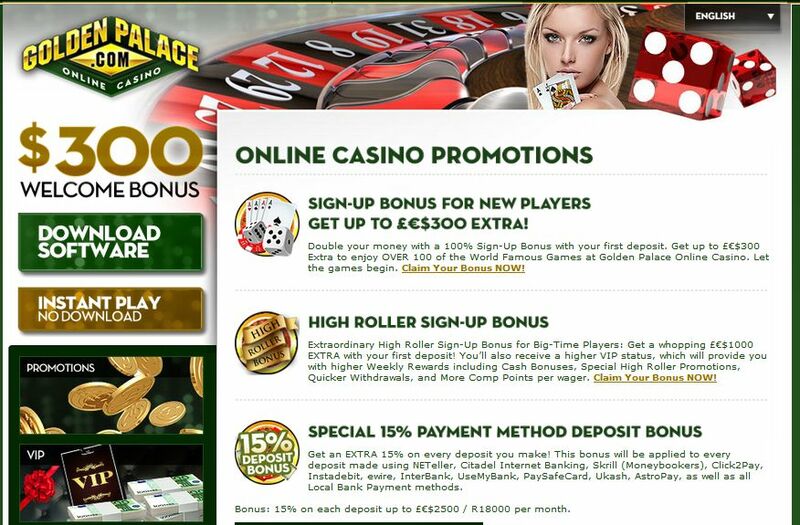 The Golden Palace Poker site offers its customers a range of different bonuses and promotions. This online poker site presents an attractive 100% sign up bonus for new players upon their first deposit at the site. Players may enjoy various promotions such as tournament entries and giveaways. In addition, Golden Palace Poker hosts a poker points program for regular players and loyal customers. To enable smooth banking operations, the Golden Palace Casino accepts a range of payment methods including credit card, Neteller, Moneybookers, Click2Pay and myCitadel. This site deals in Euro, the GB Pound and the U.S. dollar. The Golden Palace Poker site makes use of 128 bit SSL technology for the protection of data and information. Sophisticated tools and methods are utilized in order to provide a safe gaming environment for customers. This site is also Technical System Testing (TST) certified. As the majority of poker gamers and other online gamers are aware, many players require some sort of assistance at some stage of playing. For this reason, a customer support service is an important element of an online gaming site. The Golden Palace Poker site offers a 24 hour support service for the convenience of its clients. Support may be obtained by telephone, e-mail and live chat.